p53 redirects here. For other uses, see P53 (disambiguation). nuclear localization signaling domain, residues 316-325. 9aaTADs mediate p53 interaction with general coactivators – TAF9, CBP/p300 (all four domains KIX, TAZ1, TAZ2 and IBiD), GCN5 and PC4, regulatory protein MDM2 and replication protein A (RPA). The convergence of the p53 9aaTAD with other members of the family was reported. It can arrest growth by holding the cell cycle at the G1/S regulation point on DNA damage recognition (if it holds the cell here for long enough, the DNA repair proteins will have time to fix the damage and the cell will be allowed to continue the cell cycle). p53 by regulating LIF has been shown to facilitate implantation in the mouse model and possibly in humans. In unstressed cells, p53 levels are kept low through a continuous degradation of p53. 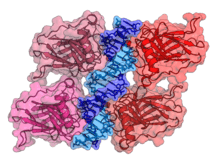 A protein called Mdm2 (also called HDM2 in humans), binds to p53, preventing its action and transports it from the nucleus to the cytosol. Also Mdm2 acts as ubiquitin ligase and covalently attaches ubiquitin to p53 and thus marks p53 for degradation by the proteasome. However, ubiquitylation of p53 is reversible. The novel molecule MI-63 binds to MDM2 making the action of p53 again possible in situations were p53's function has become inhibited. A ubiquitin specific protease, USP7 (or HAUSP), can cleave ubiquitin off p53, thereby protecting it from proteasome-dependent degradation via the ubiquitin ligase pathway. This is one means by which p53 is stabilized in response to oncogenic insults. USP42 has also been shown to deubiquitinate p53 and may be required for the ability of p53 to respond to stress. USP10 however has been shown to be located in the cytoplasm in unstressed cells and deubiquitinates cyptoplasmic p53, reversing Mdm2 ubiquitination. Following DNA damage, USP10 translocates to the nucleus and contributes to p53 stability. Also USP10 does not interact with Mdm2. The large spectrum of cancer phenotypes due to mutations in the TP53 gene is also supported by the fact that different isoforms of p53 proteins have different cellular mechanisms for prevention against cancer. Mutations in TP53 can give rise to different isoforms, preventing their overall functionality in different cellular mechanisms and thereby extending the cancer phenotype from mild to severe. Recents studies show that p53 isoforms are differentially expressed in different human tissues, and the loss-of-function or gain-of-function mutations within the isoforms can cause tissue-specific cancer or provides cancer stem cell potential in different tissues. It was initially presumed to be an oncogene due to the use of mutated cDNA following purification of tumour cell mRNA. Its character as a tumor suppressor gene was finally revealed in 1989 by Bert Vogelstein at the Johns Hopkins School of Medicine. Warren Maltzman, of the Waksman Institute of Rutgers University first demonstrated that TP53 was responsive to DNA damage in the form of ultraviolet radiation. In a series of publications in 1991–92, Michael Kastan, Johns Hopkins University, reported that TP53 was a critical part of a signal transduction pathway that helped cells respond to DNA damage. As 95% of human genes, TP53 encodes more than one protein. In 2005 several isoforms were discovered and until now, 12 human p53 isoforms were identified (p53α, p53β, p53γ, ∆40p53α, ∆40p53β, ∆40p53γ, ∆133p53α, ∆133p53β, ∆133p53γ, ∆160p53α, ∆160p53β, ∆160p53γ). Furthermore, p53 isoforms are expressed in a tissue dependent manner and p53α is never expressed alone. Peto's Paradox is the observation, due to Richard Peto, that at the species level, the incidence of cancer does not appear to correlate with the number of cells in an organism. For example, the incidence of cancer in humans is much higher than the incidence of cancer in whales. This is despite the fact that a whale has many more cells than a human. If the probability of carcinogenesis were constant across cells, one would expect whales to have a higher incidence of cancer than humans. The same is true of elephants. In October 2015, two independent studies showed that elephants have 20 copies of a tumor suppressor gene TP53 in their genome, where humans and other mammals have only one, thus providing a possible solution to the paradox. ↑ "Diseases that are genetically associated with TP53 view/edit references on wikidata". 1 2 3 Surget S, Khoury MP, Bourdon JC (19 December 2013). "Uncovering the role of p53 splice variants in human malignancy: a clinical perspective". OncoTargets and Therapy. 7: 57–68. doi:10.2147/OTT.S53876. PMID 24379683. ↑ Read, A. P.; Strachan, T.. Human molecular genetics 2. New York: Wiley; 1999. ISBN 0-471-33061-2. Chapter 18: Cancer Genetics. 1 2 3 Matlashewski G, Lamb P, Pim D, Peacock J, Crawford L, Benchimol S (1984). "Isolation and characterization of a human p53 cDNA clone: expression of the human p53 gene". EMBO J. 3 (13): 3257–62. PMC 557846 . PMID 6396087. 1 2 Isobe M, Emanuel BS, Givol D, Oren M, Croce CM (1986). "Localization of gene for human p53 tumour antigen to band 17p13". Nature. 320 (6057): 84–5. doi:10.1038/320084a0. PMID 3456488. 1 2 Kern SE, Kinzler KW, Bruskin A, Jarosz D, Friedman P, Prives C, Vogelstein B (1991). "Identification of p53 as a sequence-specific DNA-binding protein". Science. 252 (5013): 1708–11. doi:10.1126/science.2047879. PMID 2047879. 1 2 McBride OW, Merry D, Givol D (1986). "The gene for human p53 cellular tumor antigen is located on chromosome 17 short arm (17p13)". Proc. Natl. Acad. Sci. U.S.A. 83 (1): 130–134. doi:10.1073/pnas.83.1.130. PMC 322805 . PMID 3001719. 1 2 3 4 Bourdon JC, Fernandes K, Murray-Zmijewski F, Liu G, Diot A, Xirodimas DP, Saville MK, Lane DP (Sep 2005). "p53 isoforms can regulate p53 transcriptional activity". Genes & Development. 19 (18): 2122–37. doi:10.1101/gad.1339905. PMID 16131611. ↑ Ziemer MA, Mason A, Carlson DM (1982). "Cell-free translations of proline-rich protein mRNAs". J. Biol. Chem. 257 (18): 11176–80. PMID 7107651. ↑ Lane, edited by Arnold J. Levine, David P. (2010). The p53 family : a subject collection from Cold Spring Harbor Perspectives in biology. Cold Spring Harbor, N.Y.: Cold Spring Harbor Laboratory Press. ISBN 978-0-87969-830-0. ↑ May P, May E (1999). "Twenty years of p53 research: structural and functional aspects of the p53 protein". Oncogene. 18 (53): 7621–36. doi:10.1038/sj.onc.1203285. PMID 10618702. ↑ OrthoMaM phylogenetic marker: TP53 coding sequence. ↑ Klug SJ, Ressing M, Koenig J, Abba MC, Agoras VM, Sengupta S, Settheetham-Ishida W, Shirasawa H, Snijders PJ, Stoler MH, Suárez-Rincón AE, Szarka K, Tachezy R, Ueda M, van der Zee AG, von Knebel Doeberitz M, Wu MT, Yamashita T, Zehbe I, Blettner M (2009). "TP53 codon 72 polymorphism and cervical cancer: a pooled analysis of individual data from 49 studies". Lancet Oncology. 10 (2): 772–784. doi:10.1016/S1470-2045(09)70187-1. PMID 19625214. ↑ Sonoyama T, Sakai A, Mita Y, Yasuda Y, Kawamoto H, Yagi T, Yoshioka M, Mimura T, Nakachi K, Ouchida M, Yamamoto K, Shimizu K (2011). "TP53 codon 72 polymorphism is associated with pancreatic cancer risk in males, smokers and drinkers". Mol Med Report. 4 (3): 489–95. doi:10.3892/mmr.2011.449. PMID 21468597. ↑ Alawadi S, Ghabreau L, Alsaleh M, Abdulaziz Z, Rafeek M, Akil N, Alkhalaf M (2011). "P53 gene polymorphisms and breast cancer risk in Arab women". Med. Oncol. 28 (3): 709–15. doi:10.1007/s12032-010-9505-4. PMID 20443084. ↑ Yu H, Huang YJ, Liu Z, Wang LE, Li G, Sturgis EM, Johnson DG, Wei Q (2011). "Effects of MDM2 promoter polymorphisms and p53 codon 72 polymorphism on risk and age at onset of squamous cell carcinoma of the head and neck". Mol. Carcinog. 50 (9): 697–706. doi:10.1002/mc.20806. PMC 3142329 . PMID 21656578. ↑ Piao JM, Kim HN, Song HR, Kweon SS, Choi JS, Yun WJ, Kim YC, Oh IJ, Kim KS, Shin MH (2011). "p53 codon 72 polymorphism and the risk of lung cancer in a Korean population". Lung Cancer. 73 (3): 264–7. doi:10.1016/j.lungcan.2010.12.017. PMID 21316118. ↑ Wang JJ, Zheng Y, Sun L, Wang L, Yu PB, Dong JH, Zhang L, Xu J, Shi W, Ren YC (2011). "TP53 codon 72 polymorphism and colorectal cancer susceptibility: a meta-analysis". Mol. Biol. Rep. 38 (8): 4847–53. doi:10.1007/s11033-010-0619-8. PMID 21140221. ↑ Jiang DK, Yao L, Ren WH, Wang WZ, Peng B, Yu L (2011). "TP53 Arg72Pro polymorphism and endometrial cancer risk: a meta-analysis". Med. Oncol. 28 (4): 1129–35. doi:10.1007/s12032-010-9597-x. PMID 20552298. ↑ Thurow HS, Haack R, Hartwig FP, Oliveira IO, Dellagostin OA, Gigante DP, Horta BL, Collares T, Seixas FK (2011). "TP53 gene polymorphism: importance to cancer, ethnicity and birth weight in a Brazilian cohort". J. Biosci. 36 (5): 823–31. doi:10.1007/s12038-011-9147-5. PMID 22116280. ↑ Huang CY, Su CT, Chu JS, Huang SP, Pu YS, Yang HY, Chung CJ, Wu CC, Hsueh YM (2011). "The polymorphisms of P53 codon 72 and MDM2 SNP309 and renal cell carcinoma risk in a low arsenic exposure area". Toxicol. Appl. Pharmacol. 257 (3): 349–55. doi:10.1016/j.taap.2011.09.018. PMID 21982800. ↑ Venot C, Maratrat M, Dureuil C, Conseiller E, Bracco L, Debussche L (1998). "The requirement for the p53 proline-rich functional domain for mediation of apoptosis is correlated with specific PIG3 gene transactivation and with transcriptional repression". EMBO J. 17 (16): 4668–79. doi:10.1093/emboj/17.16.4668. PMC 1170796 . PMID 9707426. 1 2 Larsen S, Yokochi T, Isogai E, Nakamura Y, Ozaki T, Nakagawara A (2010). "LMO3 interacts with p53 and inhibits its transcriptional activity". Biochem. Biophys. Res. Commun. 392 (3): 252–7. doi:10.1016/j.bbrc.2009.12.010. PMID 19995558. ↑ Harms KL, Chen X (2005). "The C Terminus of p53 Family Proteins Is a Cell Fate Determinant". Mol. Cell. Biol. 25 (5): 2014–30. doi:10.1128/MCB.25.5.2014-2030.2005. PMC 549381 . PMID 15713654. ↑ Piskacek S, Gregor M, Nemethova M, Grabner M, Kovarik P, Piskacek M (2007). "Nine-amino-acid transactivation domain: establishment and prediction utilities". Genomics. 89 (6): 756–68. doi:10.1016/j.ygeno.2007.02.003. PMID 17467953. ↑ Uesugi M, Nyanguile O, Lu H, Levine AJ, Verdine GL (1997). "Induced alpha helix in the VP16 activation domain upon binding to a human TAFf". Science. 277 (5330): 1310–3. doi:10.1126/science.277.5330.1310. PMID 9271577. ; Uesugi M, Verdine GL (1999). "The α-helical FXXΦΦ motif in p53: TAF interaction and discrimination by MDM2". Proc. Natl. Acad. Sci. U.S.A. 96 (26): 14801–6. doi:10.1073/pnas.96.26.14801. PMC 24728 . PMID 10611293. ; Choi Y, Asada S, Uesugi M (2000). "Divergent hTAFII31-binding motifs hidden in activation domains". J. Biol. Chem. 275 (21): 15912–6. doi:10.1074/jbc.275.21.15912. PMID 10821850. ; Venot C, Maratrat M, Sierra V, Conseiller E, Debussche L (1999). "Definition of a p53 transactivation function-deficient mutant and characterization of two independent p53 transactivation subdomains". Oncogene. 18 (14): 2405–10. doi:10.1038/sj.onc.1202539. PMID 10327062. ; Lin J, Chen J, Elenbaas B, Levine AJ (1994). "Several hydrophobic amino acids in the p53 amino-terminal domain are required for transcriptional activation, binding to mdm-2 and the adenovirus 5 E1B 55-kD protein". Genes Dev. 8 (10): 1235–46. doi:10.1101/gad.8.10.1235. PMID 7926727. 1 2 Piskacek M, Havelka M, Rezacova M, Knight M. "The 9aaTAD Transactivation Domains: From Gal4 to p53". PLOS ONE. doi:10.1371/journal.pone.0162842. ↑ Piskacek S, Gregor M, Nemethova M, Grabner M, Kovarik P, Piskacek M (2007). "Nine-amino-acid transactivation domain: establishment and prediction utilities". Genomics. 89 (6): 756–68. doi:10.1016/j.ygeno.2007.02.003. PMID 17467953. ; Piskacek M (2009). "9aaTAD is a common transactivation domain recruits multiple general coactivators TAF9, MED15, CBP/p300 and GCN5". Nature Precedings Pre-publication. doi:10.1038/npre.2009.3488.2. ; Piskacek M (2009). "9aaTADs mimic DNA to interact with a pseudo-DNA Binding Domain KIX of Med15 (Molecular Chameleons)". Nature Precedings Pre-publication. doi:10.1038/npre.2009.3939.1. ; Piskacek M (2009). "9aaTAD Prediction result (2006)". Nature Precedings Pre-publication. doi:10.1038/npre.2009.3984.1. ↑ Bell S, Klein C, Müller L, Hansen S, Buchner J (2002). "p53 contains large unstructured regions in its native state". J. Mol. Biol. 322 (5): 917–27. doi:10.1016/S0022-2836(02)00848-3. PMID 12367518. ↑ Gilbert, Scott F. Developmental Biology, 10th ed. Sunderland, MA USA: Sinauer Associates, Inc. Publishers. p. 588. ↑ Mraz M, Malinova K, Kotaskova J, Pavlova S, Tichy B, Malcikova J, Stano Kozubik K, Smardova J, Brychtova Y (2009). "MiR-34a, miR-29c and miR-17-5p are downregulated in CLL patients with TP53 abnormalities". Leukemia: official journal of the Leukemia Society of America, Leukemia Research Fund, U.K. 23 (6): 1159–63. doi:10.1038/leu.2008.377. PMID 19158830. ↑ National Center for Biotechnology Information. United States National Institutes of Health. The p53 tumor suppressor protein [Retrieved 2008-05-28]. ↑ Bates S, Phillips AC, Clark PA, Stott F, Peters G, Ludwig RL, Vousden KH (1998). "p14ARF links the tumour suppressors RB and p53". Nature. 395 (6698): 124–5. doi:10.1038/25867. PMID 9744267. ↑ Hu W, Feng Z, Teresky AK, Levine AJ (2007). "p53 regulates maternal reproduction through LIF". Nature. 450 (7170): 721–4. doi:10.1038/nature05993. PMID 18046411. ↑ Genome's guardian gets a tan started. March 17, 2007 [Retrieved 2007-03-29]. New Scientist. ↑ Cui R, Widlund HR, Feige E, Lin JY, Wilensky DL, Igras VE, D'Orazio J, Fung CY, Schanbacher CF, Granter SR, Fisher DE (2007). "Central role of p53 in the suntan response and pathologic hyperpigmentation". Cell. 128 (5): 853–64. doi:10.1016/j.cell.2006.12.045. PMID 17350573. ↑ Han ES, Muller FL, Pérez VI, Qi W, Liang H, Xi L, Fu C, Doyle E, Hickey M, Cornell J, Epstein CJ, Roberts LJ, Van Remmen H, Richardson A (2008). "The in vivo Gene Expression Signature of Oxidative Stress". Physiol. Genomics. 34 (1): 112–26. doi:10.1152/physiolgenomics.00239.2007. PMC 2532791 . PMID 18445702. ↑ Hock AK, Vigneron AM, Carter S, Ludwig RL, Vousden KH (2011). "Regulation of p53 stability and function by the deubiquitinating enzyme USP42". EMBO J. 30 (24): 4921–30. doi:10.1038/emboj.2011.419. PMID 22085928. ↑ Yuan J, Luo K, Zhang L, Cheville JC, Lou Z (2010). "USP10 regulates p53 localization and stability by deubiquitinating p53". Cell. 140 (3): 384–96. doi:10.1016/j.cell.2009.12.032. PMC 2820153 . PMID 20096447. ↑ Vakhrusheva O, Smolka C, Gajawada P, Kostin S, Boettger T, Kubin T, Braun T, Bober (2008). "Sirt7 increases stress resistance of cardiomyocytes and prevents apoptosis and inflammatory cardiomyopathy in mice". Circ. Res. 102 (6): 703–10. doi:10.1161/CIRCRESAHA.107.164558. PMID 18239138. ↑ Hollstein M, Sidransky D, Vogelstein B, Harris CC (1991). "p53 mutations in human cancers". Science. 253 (5015): 49–53. doi:10.1126/science.1905840. PMID 1905840. ↑ Schmitt CA, Fridman JS, Yang M, Baranov E, Hoffman RM, Lowe SW (2002). "Dissecting p53 tumor suppressor functions in vivo". Cancer Cell. 1 (3): 289–298. doi:10.1016/S1535-6108(02)00047-8. PMID 12086865. ↑ Tyner SD, Venkatachalam S, Choi J, Jones S, Ghebranious N, Igelmann H, Lu X, Soron G, Cooper B, Brayton C, Hee Park S, Thompson T, Karsenty G, Bradley A, Donehower LA (2002). "p53 mutant mice that display early ageing-associated phenotypes". Nature. 415 (6867): 45–53. doi:10.1038/415045a. PMID 11780111. 1 2 Ventura A, Kirsch DG, McLaughlin ME, Tuveson DA, Grimm J, Lintault L, Newman J, Reczek EE, Weissleder R, Jacks T (2007). "Restoration of p53 function leads to tumour regression in vivo". Nature. 445 (7128): 661–5. doi:10.1038/nature05541. PMID 17251932. ↑ Herce HD, Deng W, Helma J, Leonhardt H, Cardoso MC (2013). "Visualization and targeted disruption of protein interactions in living cells". Nat Commun. 4: 2660. doi:10.1038/ncomms3660. PMC 3826628 . PMID 24154492. ↑ Pearson S, Jia H, Kandachi K (Jan 2004). "China approves first gene therapy". Nature Biotechnology. 22 (1): 3–4. doi:10.1038/nbt0104-3. PMID 14704685. ↑ Angeletti PC, Zhang L, Wood C (2008). "The Viral Etiology of AIDS-Associated Malignancies". Adv. Pharmacol. 56: 509–57. doi:10.1016/S1054-3589(07)56016-3. PMC 2149907 . PMID 18086422. 1 2 Bullock AN, Henckel J, DeDecker BS, Johnson CM, Nikolova PV, Proctor MR, Lane DP, Fersht AR (1997). "Thermodynamic stability of wild-type and mutant p53 core domain". Proc. Natl. Acad. Sci. U.S.A. 94 (26): 14338–42. doi:10.1073/pnas.94.26.14338. PMC 24967 . PMID 9405613. ↑ Abraham SA, Hopcroft LE, Carrick E, Drotar ME, Dunn K, Williamson AJ, Korfi K, Baquero P, Park LE, Scott MT, Pellicano F, Pierce A, Copland M, Nourse C, Grimmond SM, Vetrie D, Whetton AD, Holyoake TL (June 2016). "Dual targeting of p53 and c-MYC selectively eliminates leukaemic stem cells". Nature. 534 (7607): 341–6. doi:10.1038/nature18288. PMID 27281222. ↑ "Scientists identify drugs to target 'Achilles heel' of Chronic Myeloid Leukaemia cells". myScience. 2016-06-08. Retrieved 2016-06-09. 1 2 Khoury MP, Bourdon JC (April 2011). "p53 Isoform – An Intracellular Microprocessor?". Genes Cancer. 4 (2): 453–465. doi:10.1177/1947601911408893. PMC 3135639 . PMID 21779513. ↑ Avery-Kiejda KA, Morten B, Wong-Brown MW, MatheA, Scott RJ (March 2014). "The relative mRNA expression ofp53 isoforms is associated with clinical features andoutcome.". Carcinogenesis. 35 (3): 586–596. doi:10.1093/carcin/bgt411. PMID 24336193. ↑ Geva-Zatorsky N, Rosenfeld N, Itzkovitz S, Milo R, Sigal A, Dekel E, Yarnitzky T, Liron Y, Polak P, Lahav G, Alon U (June 2006). "Oscillations and variability in the p53 system". Mol. Syst. Biol. 2: 1–13. doi:10.1038/msb4100068. PMC 1681500 . ↑ Proctor Carole J, Gray Douglas A (August 2008). "Explaining oscillations and variability in the p53-Mdm2 system". BMC Systems Biology. 2 (75). doi:10.1186/1752-0509-2-75. ↑ Chong KH, Samarasinghe S, Kulasiri D (December 2013). "Mathematical modelling of p53 basal dynamics and DNA damage response". C-fACS (20th International Congress on Mathematical Modelling and Simulation): 670–6. ↑ Chumakov PM, Iotsova VS, Georgiev GP (1982). "[Isolation of a plasmid clone containing the mRNA sequence for mouse nonviral T-antigen]". Dokl. Akad. Nauk SSSR (in Russian). 267 (5): 1272–5. PMID 6295732. ↑ Oren M, Levine AJ (1983). "Molecular cloning of a cDNA specific for the murine p53 cellular tumor antigen". Proc. Natl. Acad. Sci. U.S.A. 80 (1): 56–9. doi:10.1073/pnas.80.1.56. PMC 393308 . PMID 6296874. ↑ Zakut-Houri R, Oren M, Bienz B, Lavie V, Hazum S, Givol D (1983). "A single gene and a pseudogene for the cellular tumour antigen p53". Nature. 306 (5943): 594–7. doi:10.1038/306594a0. PMID 6646235. ↑ Zakut-Houri R, Bienz-Tadmor B, Givol D, Oren M (1985). "Human p53 cellular tumor antigen: cDNA sequence and expression in COS cells". EMBO J. 4 (5): 1251–5. PMC 554332 . PMID 4006916. ↑ Baker SJ, Fearon ER, Nigro JM, Hamilton SR, Preisinger AC, Jessup JM, vanTuinen P, Ledbetter DH, Barker DF, Nakamura Y, White R, Vogelstein B (1989). "Chromosome 17 deletions and p53 gene mutations in colorectal carcinomas". Science. 244 (4901): 217–21. doi:10.1126/science.2649981. PMID 2649981. ↑ Maltzman W, Czyzyk L (1984). "UV irradiation stimulates levels of p53 cellular tumor antigen in nontransformed mouse cells". Mol. Cell. Biol. 4 (9): 1689–94. PMC 368974 . PMID 6092932. ↑ Kastan MB, Kuerbitz SJ (1993). "Control of G1 arrest after DNA damage". Environ. Health Perspect. 101 Suppl 5 (Suppl 5): 55–8. doi:10.2307/3431842. PMC 1519427 . PMID 8013425. ↑ Koshland DE (1993). "Molecule of the year". Science. 262 (5142): 1953. doi:10.1126/science.8266084. PMID 8266084. ↑ Zhu J, Zhang S, Jiang J, Chen X (Dec 2000). "Definition of the p53 functional domains necessary for inducing apoptosis". The Journal of Biological Chemistry. 275 (51): 39927–34. doi:10.1074/jbc.M005676200. PMID 10982799. 1 2 Han JM, Park BJ, Park SG, Oh YS, Choi SJ, Lee SW, Hwang SK, Chang SH, Cho MH, Kim S (Aug 2008). "AIMP2/p38, the scaffold for the multi-tRNA synthetase complex, responds to genotoxic stresses via p53". Proceedings of the National Academy of Sciences of the United States of America. 105 (32): 11206–11. doi:10.1073/pnas.0800297105. PMC 2516205 . PMID 18695251. 1 2 Kojic S, Medeot E, Guccione E, Krmac H, Zara I, Martinelli V, Valle G, Faulkner G (May 2004). "The Ankrd2 protein, a link between the sarcomere and the nucleus in skeletal muscle". Journal of Molecular Biology. 339 (2): 313–25. doi:10.1016/j.jmb.2004.03.071. PMID 15136035. 1 2 Gueven N, Becherel OJ, Kijas AW, Chen P, Howe O, Rudolph JH, Gatti R, Date H, Onodera O, Taucher-Scholz G, Lavin MF (May 2004). "Aprataxin, a novel protein that protects against genotoxic stress". Human Molecular Genetics. 13 (10): 1081–93. doi:10.1093/hmg/ddh122. PMID 15044383. 1 2 Fabbro M, Savage K, Hobson K, Deans AJ, Powell SN, McArthur GA, Khanna KK (Jul 2004). "BRCA1-BARD1 complexes are required for p53Ser-15 phosphorylation and a G1/S arrest following ionizing radiation-induced DNA damage". The Journal of Biological Chemistry. 279 (30): 31251–8. doi:10.1074/jbc.M405372200. PMID 15159397. 1 2 3 Kim ST, Lim DS, Canman CE, Kastan MB (Dec 1999). "Substrate specificities and identification of putative substrates of ATM kinase family members". The Journal of Biological Chemistry. 274 (53): 37538–43. doi:10.1074/jbc.274.53.37538. PMID 10608806. ↑ Kang J, Ferguson D, Song H, Bassing C, Eckersdorff M, Alt FW, Xu Y (Jan 2005). "Functional interaction of H2AX, NBS1, and p53 in ATM-dependent DNA damage responses and tumor suppression". Molecular and Cellular Biology. 25 (2): 661–70. doi:10.1128/MCB.25.2.661-670.2005. PMC 543410 . PMID 15632067. ↑ Khanna KK, Keating KE, Kozlov S, Scott S, Gatei M, Hobson K, Taya Y, Gabrielli B, Chan D, Lees-Miller SP, Lavin MF (Dec 1998). "ATM associates with and phosphorylates p53: mapping the region of interaction". Nature Genetics. 20 (4): 398–400. doi:10.1038/3882. PMID 9843217. ↑ Westphal CH, Schmaltz C, Rowan S, Elson A, Fisher DE, Leder P (May 1997). "Genetic interactions between atm and p53 influence cellular proliferation and irradiation-induced cell cycle checkpoints". Cancer Research. 57 (9): 1664–7. PMID 9135004. ↑ Stelzl U, Worm U, Lalowski M, Haenig C, Brembeck FH, Goehler H, Stroedicke M, Zenkner M, Schoenherr A, Koeppen S, Timm J, Mintzlaff S, Abraham C, Bock N, Kietzmann S, Goedde A, Toksöz E, Droege A, Krobitsch S, Korn B, Birchmeier W, Lehrach H, Wanker EE (Sep 2005). "A human protein-protein interaction network: a resource for annotating the proteome". Cell. 122 (6): 957–68. doi:10.1016/j.cell.2005.08.029. PMID 16169070. ↑ Yan C, Wang H, Boyd DD (Mar 2002). "ATF3 represses 72-kDa type IV collagenase (MMP-2) expression by antagonizing p53-dependent trans-activation of the collagenase promoter". The Journal of Biological Chemistry. 277 (13): 10804–12. doi:10.1074/jbc.M112069200. PMID 11792711. ↑ Chen SS, Chang PC, Cheng YW, Tang FM, Lin YS (Sep 2002). "Suppression of the STK15 oncogenic activity requires a transactivation-independent p53 function". The EMBO Journal. 21 (17): 4491–9. doi:10.1093/emboj/cdf409. PMC 126178 . PMID 12198151. ↑ Leu JI, Dumont P, Hafey M, Murphy ME, George DL (May 2004). "Mitochondrial p53 activates Bak and causes disruption of a Bak-Mcl1 complex". Nature Cell Biology. 6 (5): 443–50. doi:10.1038/ncb1123. PMID 15077116. 1 2 3 4 5 6 Dong Y, Hakimi MA, Chen X, Kumaraswamy E, Cooch NS, Godwin AK, Shiekhattar R (Nov 2003). "Regulation of BRCC, a holoenzyme complex containing BRCA1 and BRCA2, by a signalosome-like subunit and its role in DNA repair". Molecular Cell. 12 (5): 1087–99. doi:10.1016/S1097-2765(03)00424-6. PMID 14636569. 1 2 3 Sengupta S, Robles AI, Linke SP, Sinogeeva NI, Zhang R, Pedeux R, Ward IM, Celeste A, Nussenzweig A, Chen J, Halazonetis TD, Harris CC (Sep 2004). "Functional interaction between BLM helicase and 53BP1 in a Chk1-mediated pathway during S-phase arrest". The Journal of Cell Biology. 166 (6): 801–13. doi:10.1083/jcb.200405128. PMC 2172115 . PMID 15364958. ↑ Wang XW, Tseng A, Ellis NA, Spillare EA, Linke SP, Robles AI, Seker H, Yang Q, Hu P, Beresten S, Bemmels NA, Garfield S, Harris CC (Aug 2001). "Functional interaction of p53 and BLM DNA helicase in apoptosis". The Journal of Biological Chemistry. 276 (35): 32948–55. doi:10.1074/jbc.M103298200. PMID 11399766. ↑ Garkavtsev IV, Kley N, Grigorian IA, Gudkov AV (Dec 2001). "The Bloom syndrome protein interacts and cooperates with p53 in regulation of transcription and cell growth control". Oncogene. 20 (57): 8276–80. doi:10.1038/sj.onc.1205120. PMID 11781842. 1 2 Yang Q, Zhang R, Wang XW, Spillare EA, Linke SP, Subramanian D, Griffith JD, Li JL, Hickson ID, Shen JC, Loeb LA, Mazur SJ, Appella E, Brosh RM, Karmakar P, Bohr VA, Harris CC (Aug 2002). "The processing of Holliday junctions by BLM and WRN helicases is regulated by p53". The Journal of Biological Chemistry. 277 (35): 31980–7. doi:10.1074/jbc.M204111200. PMID 12080066. ↑ Abramovitch S, Werner H (2003). "Functional and physical interactions between BRCA1 and p53 in transcriptional regulation of the IGF-IR gene". Hormone and Metabolic Research = Hormon- Und Stoffwechselforschung = Hormones Et Métabolisme. 35 (11-12): 758–62. doi:10.1055/s-2004-814154. PMID 14710355. ↑ Ouchi T, Monteiro AN, August A, Aaronson SA, Hanafusa H (Mar 1998). "BRCA1 regulates p53-dependent gene expression". Proceedings of the National Academy of Sciences of the United States of America. 95 (5): 2302–6. doi:10.1073/pnas.95.5.2302. PMC 19327 . PMID 9482880. ↑ Chai YL, Cui J, Shao N, Shyam E, Reddy P, Rao VN (Jan 1999). "The second BRCT domain of BRCA1 proteins interacts with p53 and stimulates transcription from the p21WAF1/CIP1 promoter". Oncogene. 18 (1): 263–8. doi:10.1038/sj.onc.1202323. PMID 9926942. ↑ Zhang H, Somasundaram K, Peng Y, Tian H, Zhang H, Bi D, Weber BL, El-Deiry WS (Apr 1998). "BRCA1 physically associates with p53 and stimulates its transcriptional activity". Oncogene. 16 (13): 1713–21. doi:10.1038/sj.onc.1201932. PMID 9582019. ↑ Marmorstein LY, Ouchi T, Aaronson SA (Nov 1998). "The BRCA2 gene product functionally interacts with p53 and RAD51". Proceedings of the National Academy of Sciences of the United States of America. 95 (23): 13869–74. doi:10.1073/pnas.95.23.13869. PMC 24938 . PMID 9811893. ↑ Uramoto H, Izumi H, Nagatani G, Ohmori H, Nagasue N, Ise T, Yoshida T, Yasumoto K, Kohno K (Apr 2003). "Physical interaction of tumour suppressor p53/p73 with CCAAT-binding transcription factor 2 (CTF2) and differential regulation of human high-mobility group 1 (HMG1) gene expression". The Biochemical Journal. 371 (Pt 2): 301–10. doi:10.1042/BJ20021646. PMC 1223307 . PMID 12534345. 1 2 Li L, Ljungman M, Dixon JE (Jan 2000). "The human Cdc14 phosphatases interact with and dephosphorylate the tumor suppressor protein p53". The Journal of Biological Chemistry. 275 (4): 2410–4. doi:10.1074/jbc.275.4.2410. PMID 10644693. ↑ Luciani MG, Hutchins JR, Zheleva D, Hupp TR (Jul 2000). "The C-terminal regulatory domain of p53 contains a functional docking site for cyclin A". Journal of Molecular Biology. 300 (3): 503–18. doi:10.1006/jmbi.2000.3830. PMID 10884347. ↑ Ababneh M, Götz C, Montenarh M (May 2001). "Downregulation of the cdc2/cyclin B protein kinase activity by binding of p53 to p34(cdc2)". Biochemical and Biophysical Research Communications. 283 (2): 507–12. doi:10.1006/bbrc.2001.4792. PMID 11327730. ↑ Abedini MR, Muller EJ, Brun J, Bergeron R, Gray DA, Tsang BK (Jun 2008). "Cisplatin induces p53-dependent FLICE-like inhibitory protein ubiquitination in ovarian cancer cells". Cancer Research. 68 (12): 4511–7. doi:10.1158/0008-5472.CAN-08-0673. PMID 18559494. 1 2 Goudelock DM, Jiang K, Pereira E, Russell B, Sanchez Y (Aug 2003). "Regulatory interactions between the checkpoint kinase Chk1 and the proteins of the DNA-dependent protein kinase complex". The Journal of Biological Chemistry. 278 (32): 29940–7. doi:10.1074/jbc.M301765200. PMID 12756247. ↑ Tian H, Faje AT, Lee SL, Jorgensen TJ (2002). "Radiation-induced phosphorylation of Chk1 at S345 is associated with p53-dependent cell cycle arrest pathways". Neoplasia. 4 (2): 171–80. doi:10.1038/sj/neo/7900219. PMC 1550321 . PMID 11896572. ↑ Zhao L, Samuels T, Winckler S, Korgaonkar C, Tompkins V, Horne MC, Quelle DE (Jan 2003). 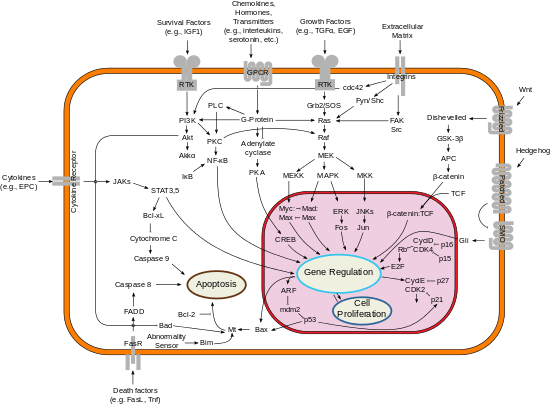 "Cyclin G1 has growth inhibitory activity linked to the ARF-Mdm2-p53 and pRb tumor suppressor pathways". Molecular Cancer Research. 1 (3): 195–206. PMID 12556559. 1 2 Ito A, Kawaguchi Y, Lai CH, Kovacs JJ, Higashimoto Y, Appella E, Yao TP (Nov 2002). "MDM2-HDAC1-mediated deacetylation of p53 is required for its degradation". The EMBO Journal. 21 (22): 6236–45. doi:10.1093/emboj/cdf616. PMC 137207 . PMID 12426395. 1 2 Livengood JA, Scoggin KE, Van Orden K, McBryant SJ, Edayathumangalam RS, Laybourn PJ, Nyborg JK (Mar 2002). "p53 Transcriptional activity is mediated through the SRC1-interacting domain of CBP/p300". The Journal of Biological Chemistry. 277 (11): 9054–61. doi:10.1074/jbc.M108870200. PMID 11782467. 1 2 Schneider E, Montenarh M, Wagner P (Nov 1998). "Regulation of CAK kinase activity by p53". Oncogene. 17 (21): 2733–41. doi:10.1038/sj.onc.1202504. PMID 9840937. 1 2 Ko LJ, Shieh SY, Chen X, Jayaraman L, Tamai K, Taya Y, Prives C, Pan ZQ (Dec 1997). "p53 is phosphorylated by CDK7-cyclin H in a p36MAT1-dependent manner". Molecular and Cellular Biology. 17 (12): 7220–9. doi:10.1128/mcb.17.12.7220. PMC 232579 . PMID 9372954. ↑ Yavuzer U, Smith GC, Bliss T, Werner D, Jackson SP (Jul 1998). "DNA end-independent activation of DNA-PK mediated via association with the DNA-binding protein C1D". Genes & Development. 12 (14): 2188–99. doi:10.1101/gad.12.14.2188. PMC 317006 . PMID 9679063. 1 2 Rizos H, Diefenbach E, Badhwar P, Woodruff S, Becker TM, Rooney RJ, Kefford RF (Feb 2003). "Association of p14ARF with the p120E4F transcriptional repressor enhances cell cycle inhibition". The Journal of Biological Chemistry. 278 (7): 4981–9. doi:10.1074/jbc.M210978200. PMID 12446718. ↑ Sandy P, Gostissa M, Fogal V, Cecco LD, Szalay K, Rooney RJ, Schneider C, Del Sal G (Jan 2000). "p53 is involved in the p120E4F-mediated growth arrest". Oncogene. 19 (2): 188–99. doi:10.1038/sj.onc.1203250. PMID 10644996. 1 2 3 Gallagher WM, Argentini M, Sierra V, Bracco L, Debussche L, Conseiller E (Jun 1999). "MBP1: a novel mutant p53-specific protein partner with oncogenic properties". Oncogene. 18 (24): 3608–16. doi:10.1038/sj.onc.1202937. PMID 10380882. ↑ Cuddihy AR, Wong AH, Tam NW, Li S, Koromilas AE (Apr 1999). "The double-stranded RNA activated protein kinase PKR physically associates with the tumor suppressor p53 protein and phosphorylates human p53 on serine 392 in vitro". Oncogene. 18 (17): 2690–702. doi:10.1038/sj.onc.1202620. PMID 10348343. ↑ Shinobu N, Maeda T, Aso T, Ito T, Kondo T, Koike K, Hatakeyama M (Jun 1999). "Physical interaction and functional antagonism between the RNA polymerase II elongation factor ELL and p53". The Journal of Biological Chemistry. 274 (24): 17003–10. doi:10.1074/jbc.274.24.17003. PMID 10358050. ↑ Grossman SR, Perez M, Kung AL, Joseph M, Mansur C, Xiao ZX, Kumar S, Howley PM, Livingston DM (Oct 1998). "p300/MDM2 complexes participate in MDM2-mediated p53 degradation". Molecular Cell. 2 (4): 405–15. doi:10.1016/S1097-2765(00)80140-9. PMID 9809062. ↑ An W, Kim J, Roeder RG (Jun 2004). "Ordered cooperative functions of PRMT1, p300, and CARM1 in transcriptional activation by p53". Cell. 117 (6): 735–48. doi:10.1016/j.cell.2004.05.009. PMID 15186775. ↑ Pastorcic M, Das HK (Nov 2000). "Regulation of transcription of the human presenilin-1 gene by ets transcription factors and the p53 protooncogene". The Journal of Biological Chemistry. 275 (45): 34938–45. doi:10.1074/jbc.M005411200. PMID 10942770. 1 2 Wang XW, Yeh H, Schaeffer L, Roy R, Moncollin V, Egly JM, Wang Z, Freidberg EC, Evans MK, Taffe BG (Jun 1995). "p53 modulation of TFIIH-associated nucleotide excision repair activity". Nature Genetics. 10 (2): 188–95. doi:10.1038/ng0695-188. PMID 7663514. ↑ Yu A, Fan HY, Liao D, Bailey AD, Weiner AM (May 2000). "Activation of p53 or loss of the Cockayne syndrome group B repair protein causes metaphase fragility of human U1, U2, and 5S genes". Molecular Cell. 5 (5): 801–10. doi:10.1016/S1097-2765(00)80320-2. PMID 10882116. ↑ Tsai RY, McKay RD (Dec 2002). "A nucleolar mechanism controlling cell proliferation in stem cells and cancer cells". Genes & Development. 16 (23): 2991–3003. doi:10.1101/gad.55671. PMC 187487 . PMID 12464630. ↑ Peng YC, Kuo F, Breiding DE, Wang YF, Mansur CP, Androphy EJ (Sep 2001). "AMF1 (GPS2) modulates p53 transactivation". Molecular and Cellular Biology. 21 (17): 5913–24. doi:10.1128/MCB.21.17.5913-5924.2001. PMC 87310 . PMID 11486030. ↑ Watcharasit P, Bijur GN, Zmijewski JW, Song L, Zmijewska A, Chen X, Johnson GV, Jope RS (Jun 2002). "Direct, activating interaction between glycogen synthase kinase-3beta and p53 after DNA damage". Proceedings of the National Academy of Sciences of the United States of America. 99 (12): 7951–5. doi:10.1073/pnas.122062299. PMC 123001 . PMID 12048243. 1 2 Akakura S, Yoshida M, Yoneda Y, Horinouchi S (May 2001). "A role for Hsc70 in regulating nucleocytoplasmic transport of a temperature-sensitive p53 (p53Val-135)". The Journal of Biological Chemistry. 276 (18): 14649–57. doi:10.1074/jbc.M100200200. PMID 11297531. ↑ Wang C, Chen J (Jan 2003). "Phosphorylation and hsp90 binding mediate heat shock stabilization of p53". The Journal of Biological Chemistry. 278 (3): 2066–71. doi:10.1074/jbc.M206697200. PMID 12427754. ↑ Peng Y, Chen L, Li C, Lu W, Chen J (Nov 2001). 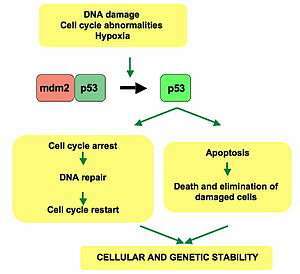 "Inhibition of MDM2 by hsp90 contributes to mutant p53 stabilization". The Journal of Biological Chemistry. 276 (44): 40583–90. doi:10.1074/jbc.M102817200. PMID 11507088. ↑ Chen D, Li M, Luo J, Gu W (Apr 2003). "Direct interactions between HIF-1 alpha and Mdm2 modulate p53 function". The Journal of Biological Chemistry. 278 (16): 13595–8. doi:10.1074/jbc.C200694200. PMID 12606552. ↑ Ravi R, Mookerjee B, Bhujwalla ZM, Sutter CH, Artemov D, Zeng Q, Dillehay LE, Madan A, Semenza GL, Bedi A (Jan 2000). "Regulation of tumor angiogenesis by p53-induced degradation of hypoxia-inducible factor 1alpha". Genes & Development. 14 (1): 34–44. doi:10.1101/gad.14.1.34. PMC 316350 . PMID 10640274. ↑ Hansson LO, Friedler A, Freund S, Rudiger S, Fersht AR (Aug 2002). "Two sequence motifs from HIF-1alpha bind to the DNA-binding site of p53". Proceedings of the National Academy of Sciences of the United States of America. 99 (16): 10305–9. doi:10.1073/pnas.122347199. PMC 124909 . PMID 12124396. ↑ An WG, Kanekal M, Simon MC, Maltepe E, Blagosklonny MV, Neckers LM (Mar 1998). "Stabilization of wild-type p53 by hypoxia-inducible factor 1alpha". Nature. 392 (6674): 405–8. doi:10.1038/32925. PMID 9537326. ↑ Kondo S, Lu Y, Debbas M, Lin AW, Sarosi I, Itie A, Wakeham A, Tuan J, Saris C, Elliott G, Ma W, Benchimol S, Lowe SW, Mak TW, Thukral SK (Apr 2003). "Characterization of cells and gene-targeted mice deficient for the p53-binding kinase homeodomain-interacting protein kinase 1 (HIPK1)". Proceedings of the National Academy of Sciences of the United States of America. 100 (9): 5431–6. doi:10.1073/pnas.0530308100. PMC 154362 . PMID 12702766. ↑ Hofmann TG, Möller A, Sirma H, Zentgraf H, Taya Y, Dröge W, Will H, Schmitz ML (Jan 2002). "Regulation of p53 activity by its interaction with homeodomain-interacting protein kinase-2". Nature Cell Biology. 4 (1): 1–10. doi:10.1038/ncb715. PMID 11740489. ↑ Kim EJ, Park JS, Um SJ (Aug 2002). "Identification and characterization of HIPK2 interacting with p73 and modulating functions of the p53 family in vivo". The Journal of Biological Chemistry. 277 (35): 32020–8. doi:10.1074/jbc.M200153200. PMID 11925430. ↑ Imamura T, Izumi H, Nagatani G, Ise T, Nomoto M, Iwamoto Y, Kohno K (Mar 2001). "Interaction with p53 enhances binding of cisplatin-modified DNA by high mobility group 1 protein". The Journal of Biological Chemistry. 276 (10): 7534–40. doi:10.1074/jbc.M008143200. PMID 11106654. ↑ Dintilhac A, Bernués J (Mar 2002). "HMGB1 interacts with many apparently unrelated proteins by recognizing short amino acid sequences". The Journal of Biological Chemistry. 277 (9): 7021–8. doi:10.1074/jbc.M108417200. PMID 11748221. ↑ Wadhwa R, Yaguchi T, Hasan MK, Mitsui Y, Reddel RR, Kaul SC (Apr 2002). "Hsp70 family member, mot-2/mthsp70/GRP75, binds to the cytoplasmic sequestration domain of the p53 protein". Experimental Cell Research. 274 (2): 246–53. doi:10.1006/excr.2002.5468. PMID 11900485. ↑ Steffan JS, Kazantsev A, Spasic-Boskovic O, Greenwald M, Zhu YZ, Gohler H, Wanker EE, Bates GP, Housman DE, Thompson LM (Jun 2000). "The Huntington's disease protein interacts with p53 and CREB-binding protein and represses transcription". Proceedings of the National Academy of Sciences of the United States of America. 97 (12): 6763–8. doi:10.1073/pnas.100110097. PMC 18731 . PMID 10823891. 1 2 Shiseki M, Nagashima M, Pedeux RM, Kitahama-Shiseki M, Miura K, Okamura S, Onogi H, Higashimoto Y, Appella E, Yokota J, Harris CC (May 2003). "p29ING4 and p28ING5 bind to p53 and p300, and enhance p53 activity". Cancer Research. 63 (10): 2373–8. PMID 12750254. ↑ Tsai KW, Tseng HC, Lin WC (Oct 2008). "Two wobble-splicing events affect ING4 protein subnuclear localization and degradation". Experimental Cell Research. 314 (17): 3130–41. doi:10.1016/j.yexcr.2008.08.002. PMID 18775696. ↑ Chang NS (Mar 2002). "The non-ankyrin C terminus of Ikappa Balpha physically interacts with p53 in vivo and dissociates in response to apoptotic stress, hypoxia, DNA damage, and transforming growth factor-beta 1-mediated growth suppression". The Journal of Biological Chemistry. 277 (12): 10323–31. doi:10.1074/jbc.M106607200. PMID 11799106. 1 2 Kurki S, Latonen L, Laiho M (Oct 2003). "Cellular stress and DNA damage invoke temporally distinct Mdm2, p53 and PML complexes and damage-specific nuclear relocalization". Journal of Cell Science. 116 (Pt 19): 3917–25. doi:10.1242/jcs.00714. PMID 12915590. 1 2 Freeman DJ, Li AG, Wei G, Li HH, Kertesz N, Lesche R, Whale AD, Martinez-Diaz H, Rozengurt N, Cardiff RD, Liu X, Wu H (Feb 2003). "PTEN tumor suppressor regulates p53 protein levels and activity through phosphatase-dependent and -independent mechanisms". Cancer Cell. 3 (2): 117–30. doi:10.1016/S1535-6108(03)00021-7. PMID 12620407. 1 2 Zhang Y, Xiong Y, Yarbrough WG (Mar 1998). "ARF promotes MDM2 degradation and stabilizes p53: ARF-INK4a locus deletion impairs both the Rb and p53 tumor suppression pathways". Cell. 92 (6): 725–34. doi:10.1016/S0092-8674(00)81401-4. PMID 9529249. ↑ Badciong JC, Haas AL (Dec 2002). "MdmX is a RING finger ubiquitin ligase capable of synergistically enhancing Mdm2 ubiquitination". The Journal of Biological Chemistry. 277 (51): 49668–75. doi:10.1074/jbc.M208593200. PMID 12393902. ↑ Shvarts A, Bazuine M, Dekker P, Ramos YF, Steegenga WT, Merckx G, van Ham RC, van der Houven van Oordt W, van der Eb AJ, Jochemsen AG (Jul 1997). "Isolation and identification of the human homolog of a new p53-binding protein, Mdmx". Genomics. 43 (1): 34–42. doi:10.1006/geno.1997.4775. PMID 9226370. ↑ Frade R, Balbo M, Barel M (Dec 2000). "RB18A, whose gene is localized on chromosome 17q12-q21.1, regulates in vivo p53 transactivating activity". Cancer Research. 60 (23): 6585–9. PMID 11118038. ↑ Drané P, Barel M, Balbo M, Frade R (Dec 1997). "Identification of RB18A, a 205 kDa new p53 regulatory protein which shares antigenic and functional properties with p53". Oncogene. 15 (25): 3013–24. doi:10.1038/sj.onc.1201492. PMID 9444950. ↑ Hu MC, Qiu WR, Wang YP (Nov 1997). "JNK1, JNK2 and JNK3 are p53 N-terminal serine 34 kinases". Oncogene. 15 (19): 2277–87. doi:10.1038/sj.onc.1201401. PMID 9393873. ↑ Lin Y, Khokhlatchev A, Figeys D, Avruch J (Dec 2002). "Death-associated protein 4 binds MST1 and augments MST1-induced apoptosis". The Journal of Biological Chemistry. 277 (50): 47991–8001. doi:10.1074/jbc.M202630200. PMID 12384512. ↑ Taniura H, Matsumoto K, Yoshikawa K (Jun 1999). "Physical and functional interactions of neuronal growth suppressor necdin with p53". The Journal of Biological Chemistry. 274 (23): 16242–8. doi:10.1074/jbc.274.23.16242. PMID 10347180. ↑ Daniely Y, Dimitrova DD, Borowiec JA (Aug 2002). "Stress-dependent nucleolin mobilization mediated by p53-nucleolin complex formation". Molecular and Cellular Biology. 22 (16): 6014–22. doi:10.1128/MCB.22.16.6014-6022.2002. PMC 133981 . PMID 12138209. ↑ Colaluca IN, Tosoni D, Nuciforo P, Senic-Matuglia F, Galimberti V, Viale G, Pece S, Di Fiore PP (Jan 2008). "NUMB controls p53 tumour suppressor activity". Nature. 451 (7174): 76–80. doi:10.1038/nature06412. PMID 18172499. 1 2 3 Choy MK, Movassagh M, Siggens L, Vujic A, Goddard M, Sánchez A, Perkins N, Figg N, Bennett M, Carroll J, Foo R (2010). "High-throughput sequencing identifies STAT3 as the DNA-associated factor for p53-NF-kappaB-complex-dependent gene expression in human heart failure". Genome Medicine. 2 (6): 37. doi:10.1186/gm158. PMC 2905097 . PMID 20546595. 1 2 Zhang Y, Wolf GW, Bhat K, Jin A, Allio T, Burkhart WA, Xiong Y (Dec 2003). "Ribosomal protein L11 negatively regulates oncoprotein MDM2 and mediates a p53-dependent ribosomal-stress checkpoint pathway". Molecular and Cellular Biology. 23 (23): 8902–12. doi:10.1128/MCB.23.23.8902-8912.2003. PMC 262682 . PMID 14612427. ↑ Nikolaev AY, Li M, Puskas N, Qin J, Gu W (Jan 2003). "Parc: a cytoplasmic anchor for p53". Cell. 112 (1): 29–40. doi:10.1016/S0092-8674(02)01255-2. PMID 12526791. ↑ Malanga M, Pleschke JM, Kleczkowska HE, Althaus FR (May 1998). "Poly(ADP-ribose) binds to specific domains of p53 and alters its DNA binding functions". The Journal of Biological Chemistry. 273 (19): 11839–43. doi:10.1074/jbc.273.19.11839. PMID 9565608. ↑ Kahyo T, Nishida T, Yasuda H (Sep 2001). "Involvement of PIAS1 in the sumoylation of tumor suppressor p53". Molecular Cell. 8 (3): 713–8. doi:10.1016/S1097-2765(01)00349-5. PMID 11583632. ↑ Wulf GM, Liou YC, Ryo A, Lee SW, Lu KP (Dec 2002). "Role of Pin1 in the regulation of p53 stability and p21 transactivation, and cell cycle checkpoints in response to DNA damage". The Journal of Biological Chemistry. 277 (50): 47976–9. doi:10.1074/jbc.C200538200. PMID 12388558. ↑ Zacchi P, Gostissa M, Uchida T, Salvagno C, Avolio F, Volinia S, Ronai Z, Blandino G, Schneider C, Del Sal G (Oct 2002). "The prolyl isomerase Pin1 reveals a mechanism to control p53 functions after genotoxic insults". Nature. 419 (6909): 853–7. doi:10.1038/nature01120. PMID 12397362. ↑ Huang SM, Schönthal AH, Stallcup MR (Apr 2001). "Enhancement of p53-dependent gene activation by the transcriptional coactivator Zac1". Oncogene. 20 (17): 2134–43. doi:10.1038/sj.onc.1204298. PMID 11360197. ↑ Xie S, Wu H, Wang Q, Cogswell JP, Husain I, Conn C, Stambrook P, Jhanwar-Uniyal M, Dai W (Nov 2001). "Plk3 functionally links DNA damage to cell cycle arrest and apoptosis at least in part via the p53 pathway". The Journal of Biological Chemistry. 276 (46): 43305–12. doi:10.1074/jbc.M106050200. PMID 11551930. ↑ Simons A, Melamed-Bessudo C, Wolkowicz R, Sperling J, Sperling R, Eisenbach L, Rotter V (Jan 1997). "PACT: cloning and characterization of a cellular p53 binding protein that interacts with Rb". Oncogene. 14 (2): 145–55. doi:10.1038/sj.onc.1200825. PMID 9010216. ↑ Fusaro G, Dasgupta P, Rastogi S, Joshi B, Chellappan S (Nov 2003). "Prohibitin induces the transcriptional activity of p53 and is exported from the nucleus upon apoptotic signaling". The Journal of Biological Chemistry. 278 (48): 47853–61. doi:10.1074/jbc.M305171200. PMID 14500729. ↑ Fogal V, Gostissa M, Sandy P, Zacchi P, Sternsdorf T, Jensen K, Pandolfi PP, Will H, Schneider C, Del Sal G (Nov 2000). "Regulation of p53 activity in nuclear bodies by a specific PML isoform". The EMBO Journal. 19 (22): 6185–95. doi:10.1093/emboj/19.22.6185. PMC 305840 . PMID 11080164. ↑ Guo A, Salomoni P, Luo J, Shih A, Zhong S, Gu W, Pandolfi PP (Oct 2000). "The function of PML in p53-dependent apoptosis". Nature Cell Biology. 2 (10): 730–6. doi:10.1038/35036365. PMID 11025664. 1 2 Zhang Z, Zhang R (Mar 2008). "Proteasome activator PA28 gamma regulates p53 by enhancing its MDM2-mediated degradation". The EMBO Journal. 27 (6): 852–64. doi:10.1038/emboj.2008.25. PMC 2265109 . PMID 18309296. ↑ Lim ST, Chen XL, Lim Y, Hanson DA, Vo TT, Howerton K, Larocque N, Fisher SJ, Schlaepfer DD, Ilic D (Jan 2008). "Nuclear FAK promotes cell proliferation and survival through FERM-enhanced p53 degradation". Molecular Cell. 29 (1): 9–22. doi:10.1016/j.molcel.2007.11.031. PMC 2234035 . PMID 18206965. ↑ Bernal JA, Luna R, Espina A, Lázaro I, Ramos-Morales F, Romero F, Arias C, Silva A, Tortolero M, Pintor-Toro JA (Oct 2002). "Human securin interacts with p53 and modulates p53-mediated transcriptional activity and apoptosis". Nature Genetics. 32 (2): 306–11. doi:10.1038/ng997. PMID 12355087. ↑ Stürzbecher HW, Donzelmann B, Henning W, Knippschild U, Buchhop S (Apr 1996). "p53 is linked directly to homologous recombination processes via RAD51/RecA protein interaction". The EMBO Journal. 15 (8): 1992–2002. PMC 450118 . PMID 8617246. ↑ Buchhop S, Gibson MK, Wang XW, Wagner P, Stürzbecher HW, Harris CC (Oct 1997). "Interaction of p53 with the human Rad51 protein". Nucleic Acids Research. 25 (19): 3868–74. doi:10.1093/nar/25.19.3868. PMC 146972 . PMID 9380510. ↑ Leng RP, Lin Y, Ma W, Wu H, Lemmers B, Chung S, Parant JM, Lozano G, Hakem R, Benchimol S (Mar 2003). "Pirh2, a p53-induced ubiquitin-protein ligase, promotes p53 degradation". Cell. 112 (6): 779–91. doi:10.1016/S0092-8674(03)00193-4. PMID 12654245. ↑ Sheng Y, Laister RC, Lemak A, Wu B, Tai E, Duan S, Lukin J, Sunnerhagen M, Srisailam S, Karra M, Benchimol S, Arrowsmith CH (Dec 2008). "Molecular basis of Pirh2-mediated p53 ubiquitylation". Nature Structural & Molecular Biology. 15 (12): 1334–42. doi:10.1038/nsmb.1521. PMID 19043414. ↑ Romanova LY, Willers H, Blagosklonny MV, Powell SN (Dec 2004). "The interaction of p53 with replication protein A mediates suppression of homologous recombination". Oncogene. 23 (56): 9025–33. doi:10.1038/sj.onc.1207982. PMID 15489903. ↑ Riva F, Zuco V, Vink AA, Supino R, Prosperi E (Dec 2001). "UV-induced DNA incision and proliferating cell nuclear antigen recruitment to repair sites occur independently of p53-replication protein A interaction in p53 wild type and mutant ovarian carcinoma cells". Carcinogenesis. 22 (12): 1971–8. doi:10.1093/carcin/22.12.1971. PMID 11751427. ↑ Lin J, Yang Q, Yan Z, Markowitz J, Wilder PT, Carrier F, Weber DJ (Aug 2004). "Inhibiting S100B restores p53 levels in primary malignant melanoma cancer cells". The Journal of Biological Chemistry. 279 (32): 34071–7. doi:10.1074/jbc.M405419200. PMID 15178678. 1 2 Minty A, Dumont X, Kaghad M, Caput D (Nov 2000). "Covalent modification of p73alpha by SUMO-1. Two-hybrid screening with p73 identifies novel SUMO-1-interacting proteins and a SUMO-1 interaction motif". The Journal of Biological Chemistry. 275 (46): 36316–23. doi:10.1074/jbc.M004293200. PMID 10961991. 1 2 Ivanchuk SM, Mondal S, Rutka JT (Jun 2008). "p14ARF interacts with DAXX: effects on HDM2 and p53". Cell Cycle. 7 (12): 1836–50. doi:10.4161/cc.7.12.6025. PMID 18583933. 1 2 Lee D, Kim JW, Seo T, Hwang SG, Choi EJ, Choe J (Jun 2002). "SWI/SNF complex interacts with tumor suppressor p53 and is necessary for the activation of p53-mediated transcription". The Journal of Biological Chemistry. 277 (25): 22330–7. doi:10.1074/jbc.M111987200. PMID 11950834. ↑ Young PJ, Day PM, Zhou J, Androphy EJ, Morris GE, Lorson CL (Jan 2002). "A direct interaction between the survival motor neuron protein and p53 and its relationship to spinal muscular atrophy". The Journal of Biological Chemistry. 277 (4): 2852–9. doi:10.1074/jbc.M108769200. PMID 11704667. ↑ Seto E, Usheva A, Zambetti GP, Momand J, Horikoshi N, Weinmann R, Levine AJ, Shenk T (Dec 1992). 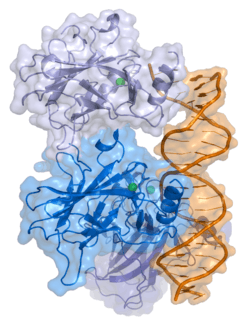 "Wild-type p53 binds to the TATA-binding protein and represses transcription". Proceedings of the National Academy of Sciences of the United States of America. 89 (24): 12028–32. doi:10.1073/pnas.89.24.12028. PMC 50691 . PMID 1465435. ↑ Cvekl A, Kashanchi F, Brady JN, Piatigorsky J (Jun 1999). "Pax-6 interactions with TATA-box-binding protein and retinoblastoma protein". Investigative Ophthalmology & Visual Science. 40 (7): 1343–50. PMID 10359315. ↑ McPherson LA, Loktev AV, Weigel RJ (Nov 2002). "Tumor suppressor activity of AP2alpha mediated through a direct interaction with p53". The Journal of Biological Chemistry. 277 (47): 45028–33. doi:10.1074/jbc.M208924200. PMID 12226108. ↑ Sørensen TS, Girling R, Lee CW, Gannon J, Bandara LR, La Thangue NB (Oct 1996). "Functional interaction between DP-1 and p53". Molecular and Cellular Biology. 16 (10): 5888–95. doi:10.1128/mcb.16.10.5888. PMC 231590 . PMID 8816502. ↑ Green DR, Chipuk JE (Jul 2006). "p53 and metabolism: Inside the TIGAR". Cell. 126 (1): 30–2. doi:10.1016/j.cell.2006.06.032. PMID 16839873. ↑ Gobert C, Skladanowski A, Larsen AK (Aug 1999). "The interaction between p53 and DNA topoisomerase I is regulated differently in cells with wild-type and mutant p53". Proceedings of the National Academy of Sciences of the United States of America. 96 (18): 10355–60. doi:10.1073/pnas.96.18.10355. PMC 17892 . PMID 10468612. ↑ Mao Y, Mehl IR, Muller MT (Feb 2002). "Subnuclear distribution of topoisomerase I is linked to ongoing transcription and p53 status". Proceedings of the National Academy of Sciences of the United States of America. 99 (3): 1235–40. doi:10.1073/pnas.022631899. PMC 122173 . PMID 11805286. 1 2 Cowell IG, Okorokov AL, Cutts SA, Padget K, Bell M, Milner J, Austin CA (Feb 2000). "Human topoisomerase IIalpha and IIbeta interact with the C-terminal region of p53". Experimental Cell Research. 255 (1): 86–94. doi:10.1006/excr.1999.4772. PMID 10666337. ↑ Derbyshire DJ, Basu BP, Serpell LC, Joo WS, Date T, Iwabuchi K, Doherty AJ (Jul 2002). "Crystal structure of human 53BP1 BRCT domains bound to p53 tumour suppressor". The EMBO Journal. 21 (14): 3863–72. doi:10.1093/emboj/cdf383. PMC 126127 . PMID 12110597. ↑ Ekblad CM, Friedler A, Veprintsev D, Weinberg RL, Itzhaki LS (Mar 2004). "Comparison of BRCT domains of BRCA1 and 53BP1: a biophysical analysis". Protein Science. 13 (3): 617–25. doi:10.1110/ps.03461404. PMC 2286730 . PMID 14978302. ↑ Lo KW, Kan HM, Chan LN, Xu WG, Wang KP, Wu Z, Sheng M, Zhang M (Mar 2005). "The 8-kDa dynein light chain binds to p53-binding protein 1 and mediates DNA damage-induced p53 nuclear accumulation". The Journal of Biological Chemistry. 280 (9): 8172–9. doi:10.1074/jbc.M411408200. PMID 15611139. ↑ Joo WS, Jeffrey PD, Cantor SB, Finnin MS, Livingston DM, Pavletich NP (Mar 2002). "Structure of the 53BP1 BRCT region bound to p53 and its comparison to the Brca1 BRCT structure". Genes & Development. 16 (5): 583–93. doi:10.1101/gad.959202. PMC 155350 . PMID 11877378. ↑ Derbyshire DJ, Basu BP, Date T, Iwabuchi K, Doherty AJ (Oct 2002). "Purification, crystallization and preliminary X-ray analysis of the BRCT domains of human 53BP1 bound to the p53 tumour suppressor". Acta Crystallographica Section D. 58 (Pt 10 Pt 2): 1826–9. doi:10.1107/S0907444902010910. PMID 12351827. 1 2 Iwabuchi K, Bartel PL, Li B, Marraccino R, Fields S (Jun 1994). "Two cellular proteins that bind to wild-type but not mutant p53". Proceedings of the National Academy of Sciences of the United States of America. 91 (13): 6098–102. doi:10.1073/pnas.91.13.6098. PMC 44145 . PMID 8016121. ↑ Naumovski L, Cleary ML (Jul 1996). "The p53-binding protein 53BP2 also interacts with Bc12 and impedes cell cycle progression at G2/M". Molecular and Cellular Biology. 16 (7): 3884–92. PMC 231385 . PMID 8668206. ↑ Tomasini R, Samir AA, Carrier A, Isnardon D, Cecchinelli B, Soddu S, Malissen B, Dagorn JC, Iovanna JL, Dusetti NJ (Sep 2003). "TP53INP1s and homeodomain-interacting protein kinase-2 (HIPK2) are partners in regulating p53 activity". The Journal of Biological Chemistry. 278 (39): 37722–9. doi:10.1074/jbc.M301979200. PMID 12851404. ↑ Okamura S, Arakawa H, Tanaka T, Nakanishi H, Ng CC, Taya Y, Monden M, Nakamura Y (Jul 2001). "p53DINP1, a p53-inducible gene, regulates p53-dependent apoptosis". Molecular Cell. 8 (1): 85–94. doi:10.1016/S1097-2765(01)00284-2. PMID 11511362. ↑ Li L, Liao J, Ruland J, Mak TW, Cohen SN (Feb 2001). "A TSG101/MDM2 regulatory loop modulates MDM2 degradation and MDM2/p53 feedback control". Proceedings of the National Academy of Sciences of the United States of America. 98 (4): 1619–24. doi:10.1073/pnas.98.4.1619. PMC 29306 . PMID 11172000. ↑ Lyakhovich A, Shekhar MP (Apr 2003). "Supramolecular complex formation between Rad6 and proteins of the p53 pathway during DNA damage-induced response". Molecular and Cellular Biology. 23 (7): 2463–75. doi:10.1128/MCB.23.7.2463-2475.2003. PMC 150718 . PMID 12640129. ↑ Shen Z, Pardington-Purtymun PE, Comeaux JC, Moyzis RK, Chen DJ (Oct 1996). "Associations of UBE2I with RAD52, UBL1, p53, and RAD51 proteins in a yeast two-hybrid system". Genomics. 37 (2): 183–6. doi:10.1006/geno.1996.0540. PMID 8921390. ↑ Bernier-Villamor V, Sampson DA, Matunis MJ, Lima CD (Feb 2002). "Structural basis for E2-mediated SUMO conjugation revealed by a complex between ubiquitin-conjugating enzyme Ubc9 and RanGAP1". Cell. 108 (3): 345–56. doi:10.1016/S0092-8674(02)00630-X. PMID 11853669. ↑ Sehat B, Andersson S, Girnita L, Larsson O (Jul 2008). "Identification of c-Cbl as a new ligase for insulin-like growth factor-I receptor with distinct roles from Mdm2 in receptor ubiquitination and endocytosis". Cancer Research. 68 (14): 5669–77. doi:10.1158/0008-5472.CAN-07-6364. PMID 18632619. ↑ Song MS, Song SJ, Kim SY, Oh HJ, Lim DS (Jul 2008). "The tumour suppressor RASSF1A promotes MDM2 self-ubiquitination by disrupting the MDM2-DAXX-HAUSP complex". The EMBO Journal. 27 (13): 1863–74. doi:10.1038/emboj.2008.115. PMC 2486425 . PMID 18566590. ↑ Yang W, Dicker DT, Chen J, El-Deiry WS (Mar 2008). "CARPs enhance p53 turnover by degrading 14-3-3sigma and stabilizing MDM2". Cell Cycle. 7 (5): 670–82. doi:10.4161/cc.7.5.5701. PMID 18382127. ↑ Abe Y, Oda-Sato E, Tobiume K, Kawauchi K, Taya Y, Okamoto K, Oren M, Tanaka N (Mar 2008). "Hedgehog signaling overrides p53-mediated tumor suppression by activating Mdm2". Proceedings of the National Academy of Sciences of the United States of America. 105 (12): 4838–43. doi:10.1073/pnas.0712216105. PMC 2290789 . PMID 18359851. ↑ Dohmesen C, Koeppel M, Dobbelstein M (Jan 2008). "Specific inhibition of Mdm2-mediated neddylation by Tip60". Cell Cycle. 7 (2): 222–31. doi:10.4161/cc.7.2.5185. PMID 18264029. ↑ Li M, Chen D, Shiloh A, Luo J, Nikolaev AY, Qin J, Gu W (Apr 2002). "Deubiquitination of p53 by HAUSP is an important pathway for p53 stabilization". Nature. 416 (6881): 648–53. doi:10.1038/nature737. PMID 11923872. ↑ Brosh RM, Karmakar P, Sommers JA, Yang Q, Wang XW, Spillare EA, Harris CC, Bohr VA (Sep 2001). "p53 Modulates the exonuclease activity of Werner syndrome protein". The Journal of Biological Chemistry. 276 (37): 35093–102. doi:10.1074/jbc.M103332200. PMID 11427532. ↑ Chang NS, Pratt N, Heath J, Schultz L, Sleve D, Carey GB, Zevotek N (Feb 2001). "Hyaluronidase induction of a WW domain-containing oxidoreductase that enhances tumor necrosis factor cytotoxicity". The Journal of Biological Chemistry. 276 (5): 3361–70. doi:10.1074/jbc.M007140200. PMID 11058590. ↑ Okamoto T, Izumi H, Imamura T, Takano H, Ise T, Uchiumi T, Kuwano M, Kohno K (Dec 2000). "Direct interaction of p53 with the Y-box binding protein, YB-1: a mechanism for regulation of human gene expression". Oncogene. 19 (54): 6194–202. doi:10.1038/sj.onc.1204029. PMID 11175333. ↑ Kelley KD, Miller KR, Todd A, Kelley AR, Tuttle R, Berberich SJ (May 2010). "YPEL3, a p53-regulated gene that induces cellular senescence". Cancer Research. 70 (9): 3566–75. doi:10.1158/0008-5472.CAN-09-3219. PMC 2862112 . PMID 20388804. ↑ Waterman MJ, Stavridi ES, Waterman JL, Halazonetis TD (Jun 1998). "ATM-dependent activation of p53 involves dephosphorylation and association with 14-3-3 proteins". Nature Genetics. 19 (2): 175–8. doi:10.1038/542. PMID 9620776. ↑ Bai L, Merchant JL (Jul 2001). "ZBP-89 promotes growth arrest through stabilization of p53". Molecular and Cellular Biology. 21 (14): 4670–83. doi:10.1128/MCB.21.14.4670-4683.2001. PMC 87140 . PMID 11416144. ↑ Yamakuchi M, Lowenstein CJ (Mar 2009). "MiR-34, SIRT1 and p53: the feedback loop". Cell Cycle. 8 (5): 712–5. doi:10.4161/cc.8.5.7753. PMID 19221490. ↑ Peto R, Roe FJ, Lee PN, Levy L, Clack J (Oct 1975). "Cancer and ageing in mice and men". British Journal of Cancer. 32 (4): 411–26. doi:10.1038/bjc.1975.242. PMC 2024769 . PMID 1212409. ↑ Nagy JD, Victor EM, Cropper JH (Aug 2007). "Why don't all whales have cancer? A novel hypothesis resolving Peto's paradox". Integrative and Comparative Biology. 47 (2): 317–28. doi:10.1093/icb/icm062. PMID 21672841. ↑ Callaway E (8 October 2015). "How elephants avoid cancer: Pachyderms have extra copies of a key tumour-fighting gene.". Nature. 526. doi:10.1038/nature.2015.18534. Lane Group at the Institute of Molecular and Cell Biology (IMCB), Singapore. p53 Knowledgebase [Retrieved 2008-04-06]. David S. Goodsel l date=2002-07-01. RCSB Protein Data Bank. p53 Tumor Suppressor [Retrieved 2008-04-06]. Thierry Soussi. p53 Web Site [Retrieved 2008-04-06].